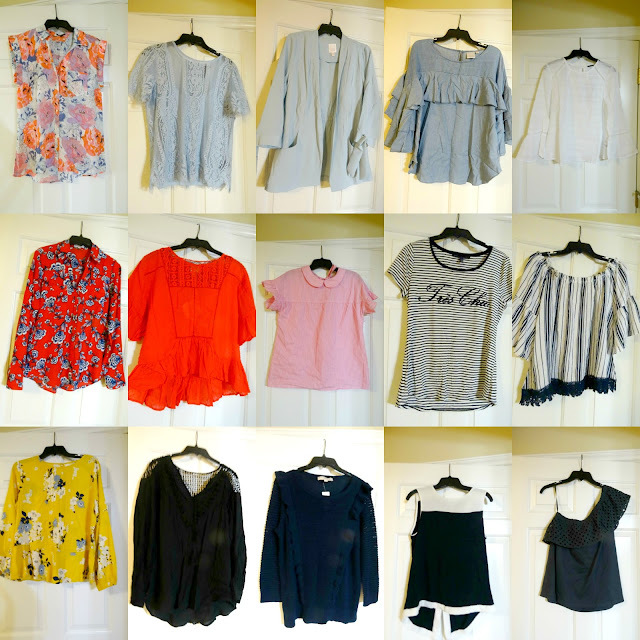 My Summer 2017 Capsule Wardrobe Items. Finally, I am posting all the 30 items I am including for my Summer Capsule this year and this time around I didn't include shoes - just tops, a jacket, bottoms, dresses and a jumpsuit. My goal is to wear and post 40 outfits using this 30 pieces so I am already one-fourth through with posting my looks (you can find ALL of these capsule outfits here). But it is taking me so long to post my items for several reasons and I apologize about that. 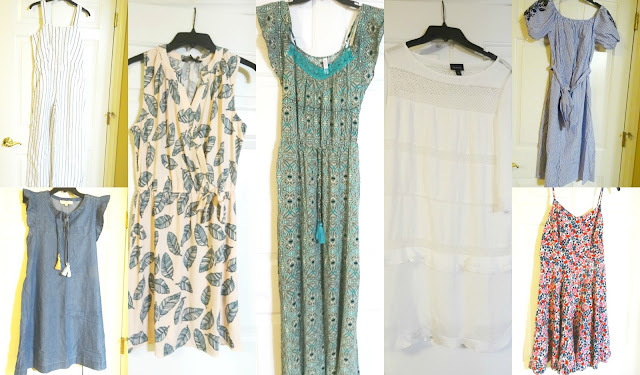 1] I switched out and swapped out a few of the pieces (mostly the dresses and tops) since I also received a couple of new things in the mail. 2] I hadn't photographed all the pieces and finally photographed the last items I swapped out the other day. 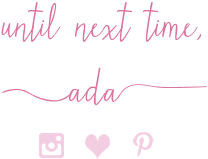 3] Adding all the proper links for you to shop all these items takes time. And by the way, not pictured (just yet) are 7 bottoms I have in this capsule: two pairs of skinny jeans (white distressed denim worn here + pink skinnies worn here) two pairs of shorts (geometric print shorts worn here) and three skirts (light pink pleated skirt worn here + tulip pencil skirt worn here). Coral/Baby Blue Floral, Cap-Sleeve, Button-Down Chiffon Blouse: The Limited (quite similar w/ reversible sleeves, Huge Steal), (similar in blush, Steal, Love this), (frilly option. Great Deal, my Favorite), (similar). Baby Blue Short-Sleeve Lace Tee: c/o "Lace and Lust" Boutique (New) (similar off-shoulder option, Steal, love this), (similar in navy, on Sale, love this), (similar teal cropped version, Great Deal, I also own this!) (similar, Splurge, my Favorite). Light Wash, Soft Chambray, 3/4-Sleeve, Ruffled Blouse: LC Conrad via Kohl's (New) (identical, on Huge Sale, love it! ), (gorgeous cold-shoulder option, Steal, love this), (similar sleeveless option, Great Deal, my Favorite), (similar off-shoulder option, Small Splurge). Light See-Through White Blouse w/ Long Bell Sleeves: Who What Wear via Target (New) (identical, Huge Steal), (similar, on Sale, love this), (similar button-down, Fantastic Deal, my Favorite), (similar elegant option). Red w/ Blue+White Floral Slim-Fit "Portofino" Button-Down Blouse: Express (same blouse in different floral print, Great Deal, my Favorite), (current frilly option by Express, on Sale, love this), (similar, Huge Steal), (similar in white+blue, Small Splurge, love this). White+Black Striped "Tres Chic" Graphic Tee: White House Black Market (similar, Huge Steal), (similar, on Huge Sale, love this), (similar, Steal), (similar, Steal, love this), (similar w/ red stripes, Huge Steal, my Favorite). Black Sheer Long-Sleeve Blouse w/ Tasseled Neckline + Crochet Back: Jacket Society (identical, on Sale, I love it! ), (similar current option from Jacket Society, on Sale), (similar bohemian option, love this), (similar, on Sale, my Favorite). Navy, Light Knit Sweater w/ Flutter Sleeves + Front Ruffle detail: Loft (New) (identical, on Huge Sale + I love it! ), (similar split-back option, I also own this in the moss green, on Sale, love this), (similar w/ cut-out sleeves, Steal), (similar w/ origami ruffle detail, on Huge Sale, my Favorite). Navy, One Shoulder Eyelet Ruffle Tank: Loft (New) (current one arm dotted option by Loft, on Sale, love this), (current similar cold-shoulder option by Loft), (similar, Huge Steal), (similar, Steal), (gorgeous gingham option, Splurge, my Favorite). Navy+White Open Tulip Back Tank Top: H&M (similar in chambray, Great Deal, my Favorite), (similar on black, on Sale), (similar in navy), (similar in stripes, love this). Medium-Wash Chambray, Flutter-Sleeve Dress w/ Tassel Laces: Loft (New) (identical, for a Steal, I love it!! ), (similar, Huge Steal), (cold-shoulder option, on Sale, love this), (similar w/ crochet detail, Splurge, my Favorite). Off-White Tiered Silky Ruffled Sheath w/ Elbow-Length Sleeves: Who What Wear via Target (similar boho sleeveless version, Steal, love this), (similar cocktail style, on Huge Sale), (similar lace dressy option, Small Splurge, love this), (similar midi option, on Sale, my Favorite). Light Blue+White Off Shoulder Dress w/ Navy Embroidery on the Sleeves: Who What Wear via Target (New) (identical, Steal + I love it! ), (similar, Great Deal), (similar, on Sale), (similar, on Huge Sale, my Favorite).